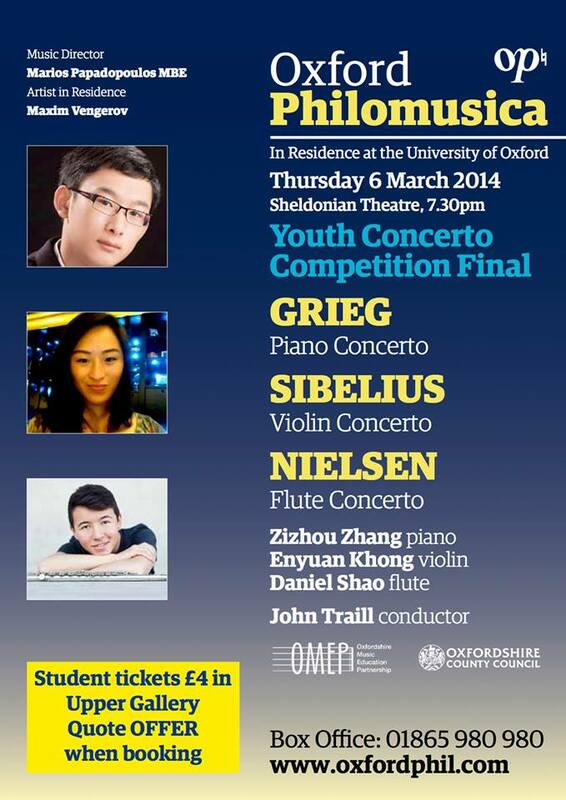 On Thursday 6th March 2014, John conducted the final the of the Oxfordshire Concerto Competition 2014, at the Sheldonian Theatre, Oxford. The competition, a partnership between the Oxford Philomusica, the University of Oxford, and the Oxfordshire County Music Service, now in its third year, was open to students under the age of 21, with links to the county. The standard was extremely high, and winner – Daniel Shao – performed meticulously, with flare and imagination. 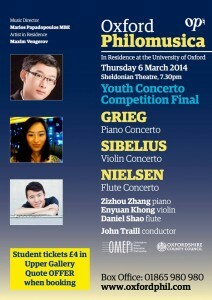 The semi-finals, also conducted by John, saw six finalists accompanied by the Oxfordshire County Youth Orchestra. The panel consisted of Marios Papadopoulos, Niel Immelman, Kathron Sturrock, Tony Mealings, and John. Previous winners include Savitri Grier (2012) and Makoto Nakata (2013).